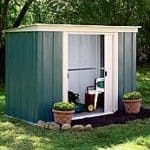 Metal sheds don’t have to come in shades of silver or green, as this attractive building from American shed giants Arrow demonstrates. 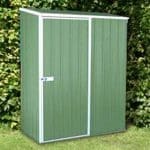 The woodgrain effect looks impressively natural, even close up, and means that this shed will fit into even the most traditional garden environment. It may look like wood, but it offers many advantages over a timber shed, including the fact that there is no requirement for annual treatment to keep the 10 year warranty valid. Metal sheds are also excellent at withstanding the UK climate, and of course there’s no need to worry about rot. With the tough electro-galvanised cladding there’s also no need to worry about rust. This cladding, in conjunction with the pitch of the apex roof, effectively stops rainwater from reaching the interior, keeping your tools and equipment dry. 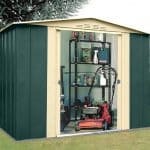 One of the things we liked most about this shed is how much storage space it provides. That’s because of the extra space provided by the tall eaves height. Thanks to the strong entrance and exit ramp included as standard, it’s very easy to use a wheelbarrow or trolley to move bulky or heavy objects inside, so you’ll be able to use this space to its full potential. 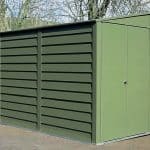 This metal apex shed has a mid sized footprint but is slightly taller than many of the metal buildings we review in this price range. That makes it very versatile, as it can be used for storing tall objects such as strimmers or garden hoes, as well as wide or bulky objects like mobility scooters or ride on lawn mowers. We were very impressed by the paintwork utilised, as the woodgrain effect is attractive and flawless in its execution. Even lovers of wooden sheds will be happy to have this in their garden. We always like to see apex roofs on metal sheds as this effectively prevents water from sitting on the surface, which over time can create rust and impact on the structural integrity of the building, and they also add extra headroom. This was especially noticeable here, with a peak height of 2.01m and an eaves height of 1.80m. The outer width of the shed is 2.53m and the outer depth is 1.82m, so you’ll need to find a flat concrete area of at least these dimensions on which to anchor the shed. When assembled, the overlap cladding effect gives it a tough and durable look, but in fact the cladding itself is quite lightweight. It has, however, been boosted by the use of electro-galvanised cladding which gives it extra toughness and resilience. For this reason, once assembled it felt surprisingly solid. Be aware, that some of the metal sheets have sharp edges, so it’s important to wear heavy duty gloves during assembly. There’s no floor to this shed, but we were pleased to see that it did come with an anchor kit. This means that you won’t have to buy any extra parts or screws to affix it to your concrete base. Alternatively, a patio or paved area can be used as long as the substrate is level and in good condition. Because we were impressed with the toughness and performance of the electro-galvanised cladding, we would have liked to see a warranty that lasted longer than the 10 year period provided here. It’s still possible, however, that this shed will last much longer than a decade without any perforations being caused by rust, and there is of course no requirement for any treatments to be carried out during this period. The double sliding doors were, for us, one of the stand out features. One advantage they have is that they’re fitted internally, which gives them inbuilt protection against both the elements and intruders. They felt smooth and relatively sturdy in operation, and have a width of 1.01m and a height of 1.72m. 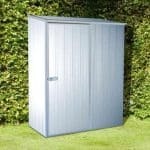 This makes them more accommodating than many doors on metal sheds we review, and they are also complemented by a wide and strong ramp. With no windows on this shed, you’ll probably want an artificial light source if you’re going to be spending any length of time inside. We found that the white painted walls, however, did create a brighter appearance if the doors were opened. A padlock is needed to secure this shed, so whilst it was good to see that the handles themselves were holed, it was a pity that a padlock itself wasn’t included. With padlock and alarm sets available for around twenty pounds this doesn’t add too much to the overall cost. As there are no windows, the security of whatever’s inside is enhanced, as the contents are hidden from prying eyes. Two optional extras that we really liked are the tool rack, made by Tool-Plus and mounted on wheels, and a resin shelving unit with four shelves. These help keep the interior tidy and well organised, which effectively makes it possible to fit more items inside, as well as making retrieval faster. We also liked the Bull Picador green wheelbarrow. It’s well made, and the perfect accompaniment for the entrance and exit ramp. Using the wheelbarrow you can easily load and unload soil, sand, and aggregate for your garden. As we expected from a leading manufacturer like Arrow, there are no shortcuts taken when it comes to the quality of components. In essence, it performs as well as it looks. Whilst the electro-galvanisation does make the cladding tougher, we still think it could have been a little thicker. As the warranty indicates, however, it should still give long lasting protection against the weather. This isn’t the deepest shed we’ve reviewed, and is indeed the second smallest in terms of base area of sheds in Arrow’s Woodvale range, but the tall ridge and eaves height increase the available storage capacity. Many of the parts look the same, so it’s important to read the instructions and prepare the components accordingly before starting to build it. You’ll need a friend to help, and it should then take about five to six hours to assemble. 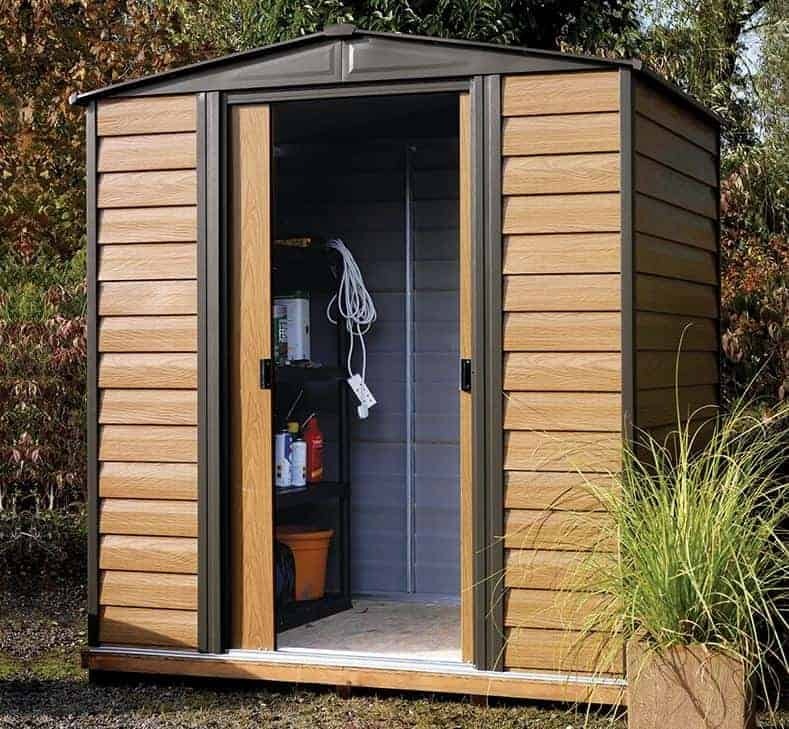 We have reviewed similar sized sheds, some with longer warranty periods, that cost slightly less than this, but this is hard to beat for its looks and build quality. Final Thoughts: Arrow are the biggest name in shed manufacture in the United States, so when you buy one of their products you can be confident in its design and build quality. 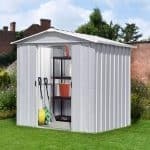 We’re very pleased that they’ve made this shed available in the United Kingdom, as it has a unique and attractive design that will appeal to people who have previously only used wooden sheds. Due to its metal structure there are no treatment requirements here, so it’s a good choice for senior citizens, people with mobility difficulties, or simply those who are too busy to spend every year re-preserving timber. With a wide door and a full width ramp, you can fit a lot inside here and the tough cladding will help keep the contents dry.